I thought I would spoil myself with the too cute for words adorable yellow Drybar Buttercup Dryer!!!!! 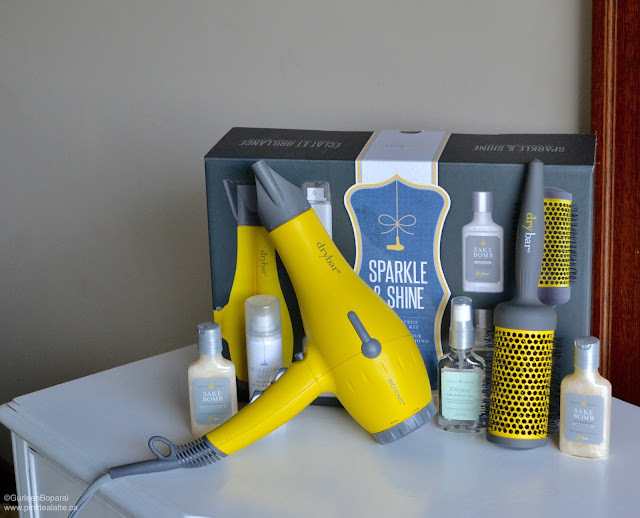 I purchased mine as part of the Sparkle & Shine Kit from the Drybar boutique in Nordstrom Vancouver. Last year, Vancouver finally got its first ever Nordstrom (the flagship store of Canada) and within Nordstrom, a Drybar! Their pricing is cheaper than higher end salons and includes wash, dry and styling. The salon also has a range of its own signature yellow products that are used at the DryBar salons as well are available for purchase. Honestly, if Drybar had not opened up in Nordstrom Vancouver, I would not have known this brand existed. In October, I needed a new hairbrush and when I walked by the Drybar, I instantly got suckered into purchasing their Lemon Drop hair brush. It made my hair so soft and shiny that I ended up purchasing several more as gifts for my friends. A random fun tidbit of knowledge by Gurleen = The Buttercup blow dryer is actually their little mascot too - the upside down yellow hair dryer! I got super lucky and was able to grab the last Sparkle & Shine kit - perhaps it was destiny!!! I want to say it was exclusively released for the Vancouver Drybar opening because I cannot find it anywhere online. In the kit, you receive the Buttercup (DUH), Double Pint Round Brush and 4 deluxe samples (Sake Bomb Shampoo, Sake Bomb Conditioner, 100 Proof Treatment Oil, Sparkling Soda Shine Mist). DryBar, your product names are ON POINTE! Sparkle & Shine Kit is $243 CAD before tax. For $3 more you got a $50 round brush plus four hair products to try. Definitely an amazing deal and I highly suggest you look out for a kit if you are looking to purchase their blow dryer. In this picture, I dried my hair straight out of the using the buttercup and round brush by DryBar. No additional products were used I did not even flat iron my hair! Also, I did not use a heat protectant.... bad me... knock on wood for having healthy virgin hair!!! Does the Buttercup Hair Dryer live up to the hype? In my opinion - YES. It thus far has been a really great investment. In the past, I have generally just used generic drugstore brand hairdryers that cost probably no more than $35. So the Buttercup is definitely an investment at $243 CAD + tax. The price is what makes me cringe. I would say it is the only deterrent for me and others. But when you use this beautiful yellow Buttercup hair dryer, you can never go back to the drugstore brands. You have been warned! Even in this extremely dry winter weather, the Buttercup is leaving my hair shiny and smooth. I no longer need to take the extra step of flat ironing my hair either! With drugstore brand hair dryers, my hair gets quite frizzy and dry aka not fun. Also, I do not know if it is because I have heavy thick hair, it took forever to dry my hair using drugstore blow dryers. And then I guess because it takes so long, my hair would get greasy and stringy like ugh FAIL I just washed my hair! Also, product wise, I simply just wash my hair with Bumble & Bumble's Gentle Shampoo and sometimes a little conditioner on the ends. I do not use any heat protectant or styling products. Just shampoo and conditioner for me. The results are purely from using the Buttercup. I use the round brush that it came with. I am still working on my technique haha. It is actually pretty tricky to simultaneously round brush and aim the blowdryer, but practice makes perfect! I really hope this was helpful! I wish I could give a Buttercup as a giveaway... hmmm DryBar - Sponsor Me! I cannot contain my excitement as I type this! I am the proud new owner of the Nikon D5500 DSLR camera! The previous DSLR I was using is my parents. Nothing wrong with that; however, they love traveling and want to take the camera with them to capture moments from their trips. Also, I have been hogging the camera, so it was time I bought my own. I went with a Nikon since the settings are familiar to me. I did not want to branch out into a different company as I would have to re-learn all the functions as well, Nikon is the biggest producer of high quality camera lenses. A lot of Canon users actually purchase Nikon lenses. After saving up money, I made the big splurge. I bought the D5500 in a bundle pack with the 18-55mm lens, commonly known as the kit lens. If you are just starting out, be sure to purchase a bundle and not purchase the body alone. There was also a 50mm lens bundle, but I purchased the lens last winter. Personally, I think it is good to have the 18-55mm lens if you are just starting out as it is easy to use and is quite diverse. The 50mm is more restrictive for what you can use it for. My new D5500! The picture is much brighter and crisper. 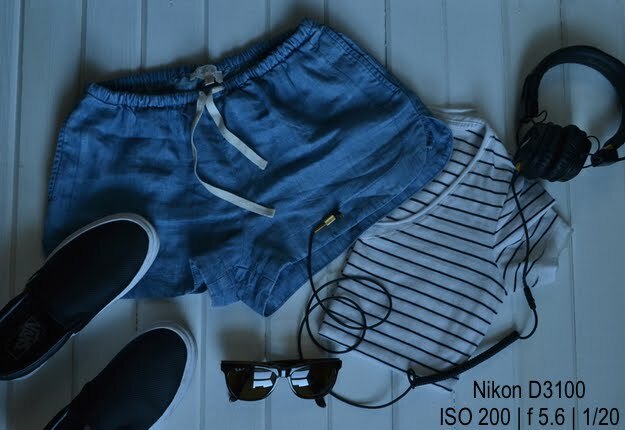 Now a little comparison between my new Nikon D5500 DSLR and my parent's Nikon D3100 DSLR. Higher resolution and clarity! There is a huge difference! My parents' Nikon D3100 I want to say was purchased around 2008? It is fairly old; however, it works perfect and we have yet to encounter a problem with it. In fact, a lot of professional photographers will purchase new lenses, but stay with their old body. Why? Because they are familiar with the camera. Haha I do not know how to explain it, but its like you know how to adjust everything on the camera to get the best picture. 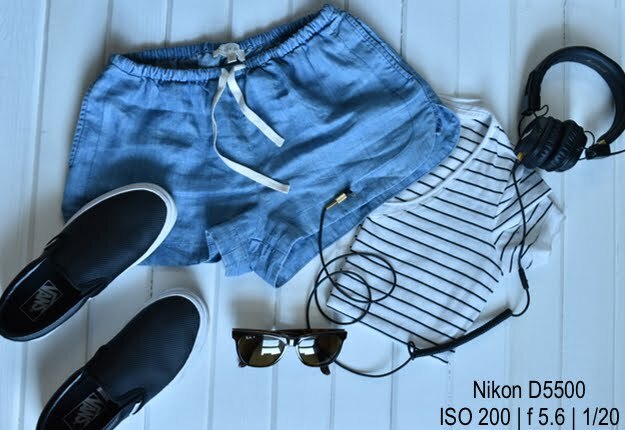 The Nikon D3100. The same settings; however, a very different picture. Much darker. When I switched the D5500, it took me a while to find my groove when it came to adjusting the settings for a picture. I have had my new camera for almost two months now and am much more comfortable using it now. My favourite part of the D5500 has got to be the flip-out LCD screen! Sometimes I want to take a selfie haha! And it makes it much easier when I am trying to film something. The flip screen is just nice. I also like that I am able to take bright pictures even in low lighting because I prefer pictures with more light and try to go for white backgrounds. I hope this post helps anyone who was thinking of getting the Nikon D5500. I definitely give it two thumbs up! I am so lucky to live in such a gorgeous city like Vancouver. 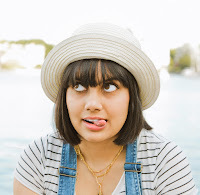 From the breathtaking mountainside views to the scrumptious healthy dining fair, Vancouver has got it all, including fabulous artists like Dana Mooney! After being an admirer of her work for over a year, I finally had the pleasure of meeting Dana in person last week. I first came across Dana's work at Yaletown's The Cross Designs shop. I could not help, but smile when I saw her work. Dana uses vibrant colours and bold brush strokes to evoke a free-spirited happy mood. Also, we all know I am a sucker for yellow gold, so yup, her use of gold leaf only drew me in more! 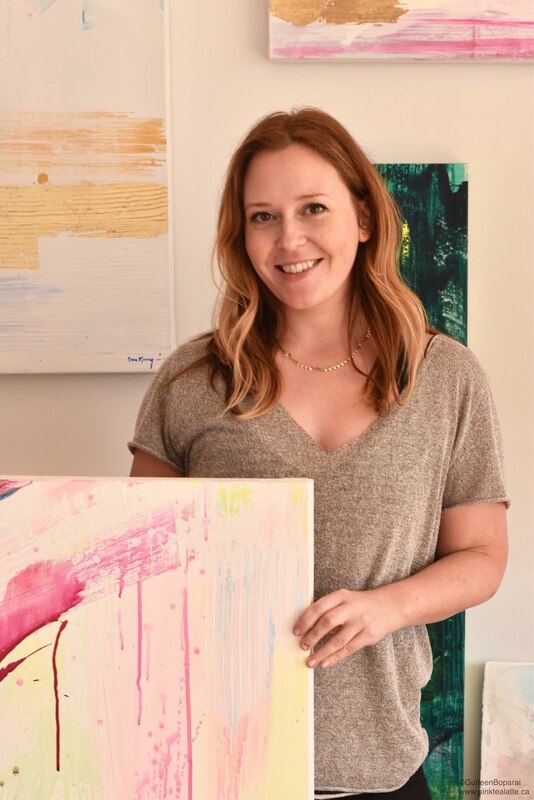 A trained make-up artist, turned interior decorator, Dana has dabbled in quite a few industries, but her passion for art always kept bringing her back to the acrylics. I guess her true canvas is stretched on a wooden frame and not a model's face or home interior. Dana loves to experiment with a variety of mediums, thus many of her works of art are multi-medium pieces. 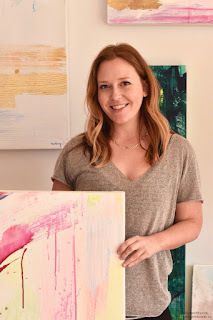 From acrylics to vibrant inks to even gouache paints, her diverse use of mediums is what makes her paintings one of a kind! While inks give her pieces vibrancy, gouache gives a unique opaque finish. I think it is really cool that Dana uses so many different elements in creating each piece. Currently going into her third year as a full time artist, Dana has been experimenting with water colours and has just launched her newest collection: The Paper Works. But because she is a lover of bright colours - YAAS - she throws in bright inks and gouache paints. The Water-scape is my favourite from this collection. 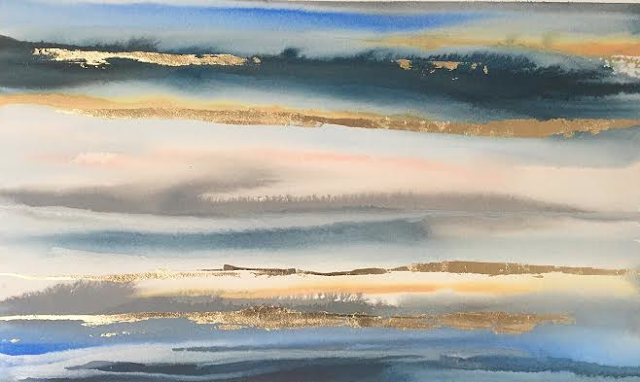 I am loving the strong linear lines and the gold leaf breaking up the darker colours. Personally, my favourite collection of Dana's has got to be her pieces that incorporate Neon Lights, a collaboration she did with another Vancouver artist, "Endeavour Neon." Her Light'em Up collection is super unique as well as fun! Only this fun gal would come up with a cool idea like that. Art is about expressing yourself and the Light'em Up collection really harnesses her bright energetic personality. Maybe this is why I am so drawn to her work because she and I are both outgoing individuals! It is time we celebrated and revere local talent! Gustav Klimt's The Kiss will always hold a special place in my heart; however, it is a shame we continue to lust over art by long dead artists and disregard the living. Also, who decided paintings such as the Mona Lisa should be worshipped? I honestly would never want to hang a creepy smiling not smiling women's portrait in my house?!?! 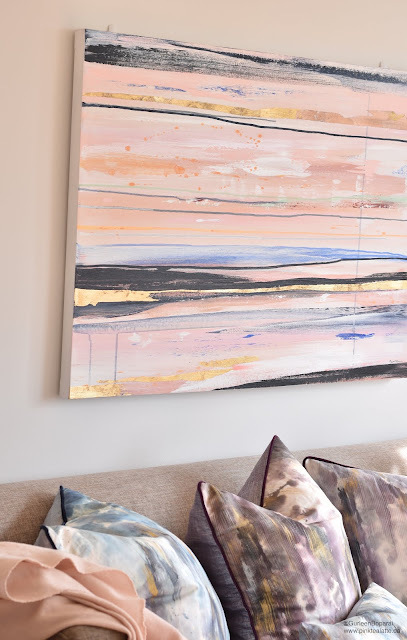 Thank you Dana Mooney for bringing exciting works of art into our homes and making us smile with your gorgeous pieces! You can check out Dana's work at her online shop Dana Mooney or her instagram (@danamooneyart) because she is always posting fun sneak peaks of current pieces she is working on! Let me know in the comments below what your favourite piece of Dana's is and if there any other local artists you would want me to check out! Thank you all for being so wonderfully patient with me! It has been quite overwhelming with finals at UBC, but I promise there will be lots and lots of new posts coming out soon! Ladurée has finally opened its doors on Robson St. and us Vancouverites can now indulge ourselves in their famous double decker macarons! The official opening was last Thursday, March 24th at 10 AM. I was sitting in a nutrition lecture at that time and I honestly did not want to wait five hours in a line. Even though it has been a week since the official opening, there was still a line out the door! Took me around 20 minutes to reach front of the line. 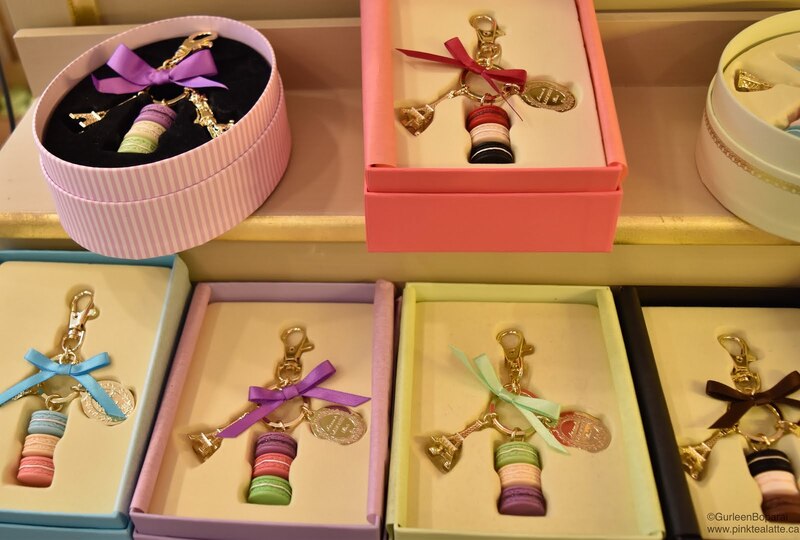 The staff are very quick and sweet; however, it is hard to make a decision of what flavours you want and what box you want your little treats to be nestled in. Too many options! But it was well worth the wait because I am not a macaron kind of gal, but the macrons from Ladurée are AMAZING! In fact, I need more! 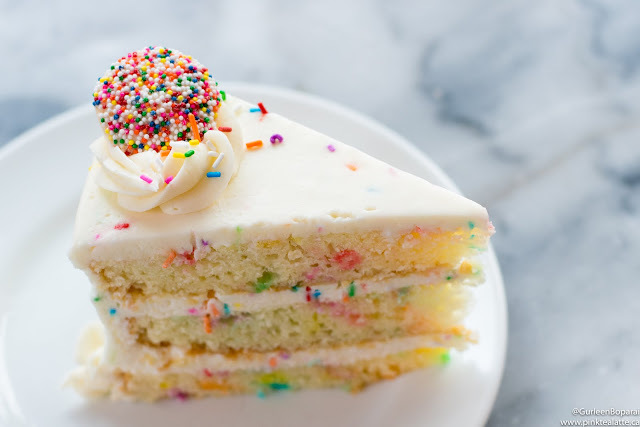 They are absolutely delicious and are not overtly sweet. I also really appreciated how there were little bits of almond in the cookies because it added a great texture. The shop is adorably cute. 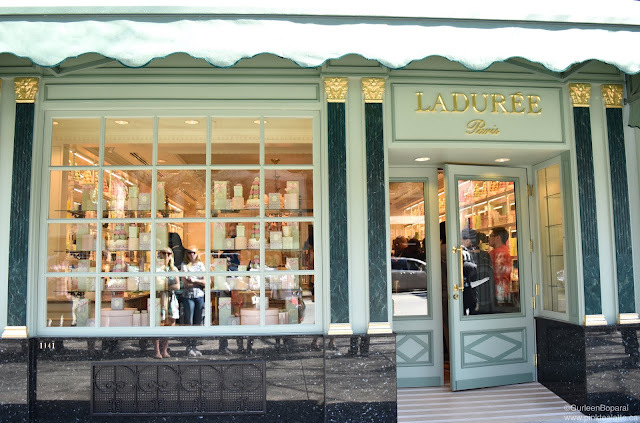 I loved the wooden window panes and the displays filled with towers of macarons and Laduree's gorgeous packaging. 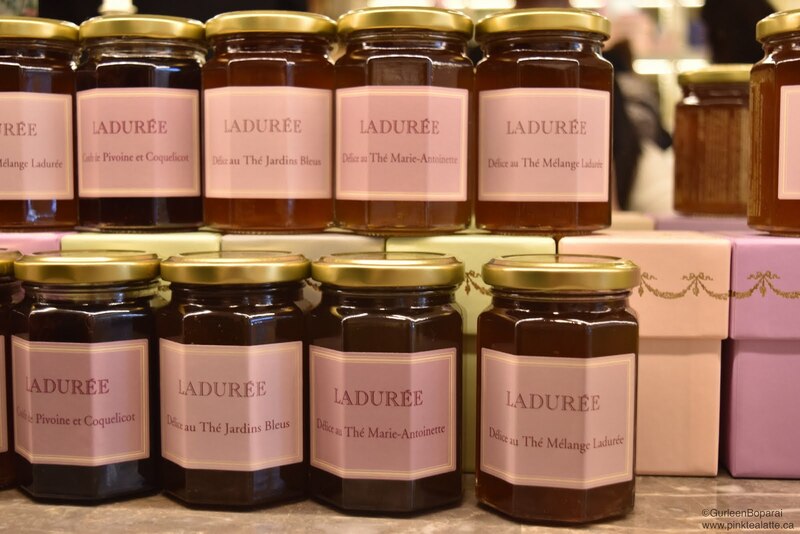 The shelves were lined with Ladurée products including jams, teas, candles and bags. I definitely want to pick up some of their jams in the future because they looked delicious! There are so many different flavours to choose from, I might just get a couple different jams. And of course, the main case was filled with rows of their delicious macarons. If you are wondering what on earth is a macaron, it is two delicate almond cookies with ganache or some sort of cream sandwiched between them. When you take a bite, initially it is crisp, but the texture soon becomes chewy and nutty. Also, the macaron cookies are made using almond flour, so it is a treat even gluten free friends can enjoy. The macarons at the Vancouver Ladurée are all flown in from the Ladurée bakeries in France. Kind of weird considering Vancouver has so many talented pastry chefs that are more then capable of making a good macaron. Because they are flown in from France, the shelf life of the macarons is shortened as well the price per macaron is increased. When I asked about the other baked goods served in the tea salon, the staff told me they are baked in-house using local ingredients, so I was happy to hear that. Perhaps in the future Ladurée may consider baking the macarons in Vancouver versus flying them in from France. They had a huge a selection of flavours and it was tough picking out just six. Eventually I settled on the six flavours I wanted to try this time around. The staff is so sweet and gave me their opinions on which flavours they liked the most and gave me a quick break down of what the flavour profile was of the uniquely named ones, like the Marie Antoinette - a baby blue coloured macaron that is tea flavoured. The first four are part of their permanent flavours and the latter two are seasonal with Maple Syrup being a Vancouver exclusive! Haha kind of funny, but eh, Canada is the land of real Maple Syrup! 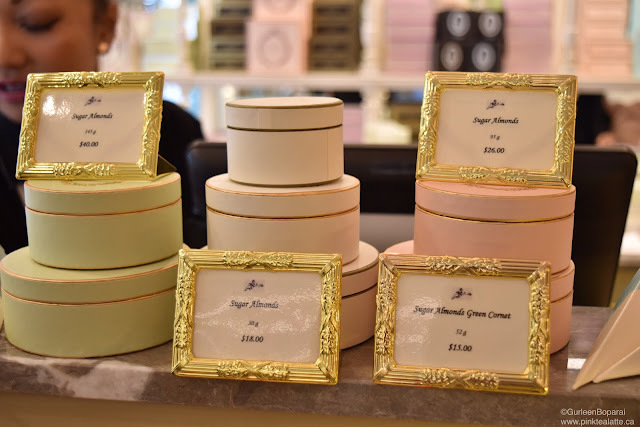 They were packaged in an ornate green cardboard box in Ladurée's signature pastel green. Super cute and really pretty! As I had said, these macarons from Ladurée are divine! I have never been much of a macaron person, you will often see me choosing a slice of cake over a macaron any day! But Ladurée definitely knows how to make a good macaron. The flavour was perfect and I really appreciated that the macarons were not very sweet. That has always been a reason why I have never liked these cookies before. Out of the 6, Raspberry and Maple Syrup were my favourite. The Maple Syrup was unique and you could really taste that real maple syrup used! It is kind of cute that they did the Maple Syrup flavour for Vancouver. The Citron did not have much flavour to it and the pistachio was nothing special. Lemon and Coffee had great flavour and I loved how tart the lemon really was. Unfortunately, I was a little shocked when I got to the register to pay. The sign stated $3 per macaron. For a box of six, it should be $18; however, I paid $26 because the box was an extra $8. That is steep! I have never ever had to pay for packaging at a patissierie or bakery before! Also, similar patisserie's across Vancouver, a box of 6 or 12 macarons are generally a little discounted, but not at Ladurée. I really wish they had made it clear that the gorgeous boxes are not included, and are in fact an extra $8... YIKES! Just saying, for the price of that cardboard box, I could have had a delicious sandwich at Faubourg for lunch. Ladurée is quite expensive and in my opinion, a little overpriced. The small jams are $15 (plus $2 for a box) and I suspect that they are imported from France. I was taken aback also by the key rings, $65! Also note, the macarons are flown in from Paris, France and are not made in house at the Vancouver location. 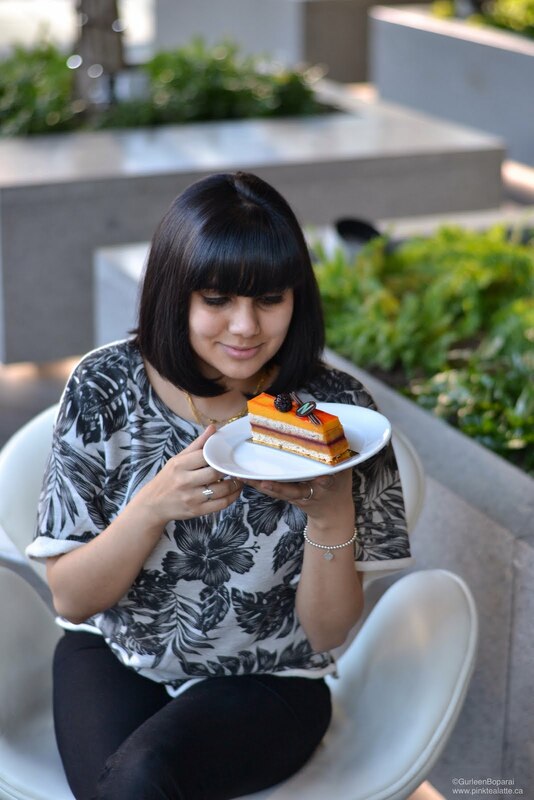 Ladurée is a great addition to Vancouver's pastry scene. I am curious to see if the lines will remain once the fresh new allure has worn off. I am also hoping that Ladurée considers baking the macarons in Vancouver and not import them France. And if it is about the ingredients, why not just import the ingredients from France? However, Ladurée's macarons are going to be tough to beat! I probably will be heading back there soon because the macarons were just that good! But I will probably ask for a plain box or something because I do not see the point of spending $8 on a small box that is also hard to re-use because of the size. 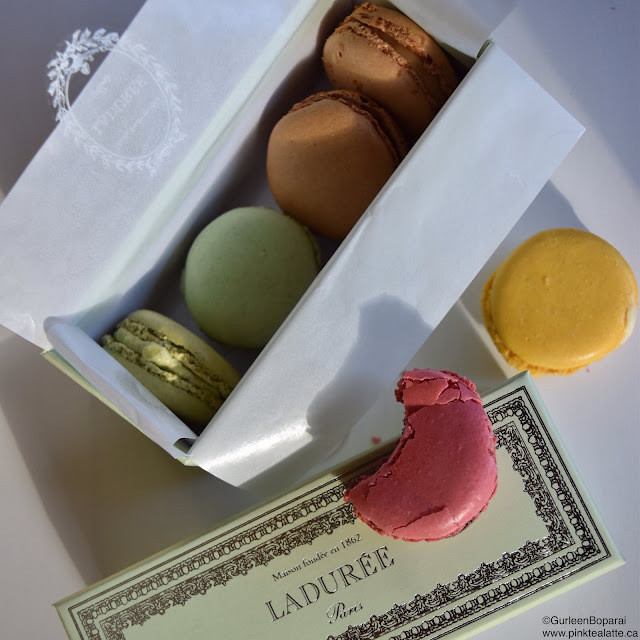 Let me know in the comments below what you think of the Ladurée store in Vancouver and if you have fallen in love with their macarons just as I have! Alos, sorry that the pictures are not so great, lighting was a little meh inside. 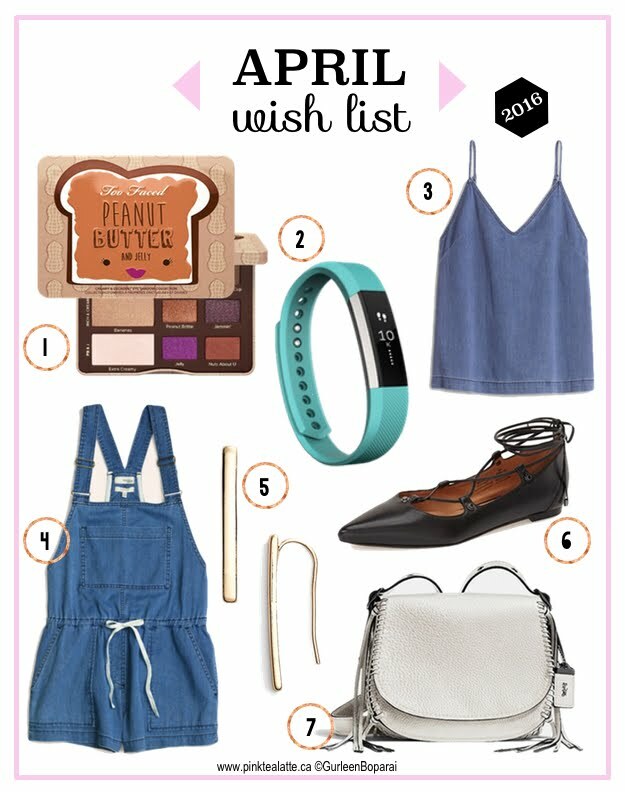 Another month means another wish list and for April, I am all about getting on top of Spring 2016 trends. This spring, I see a lot of denim, eyelet designs, tassels and fun colours. I really want to get my hands on Too Faced's Peanut Butter and Jelly eye shadow pallet, but it seems to be sold out already :( And I can totally see why because the packaging is so darn cute and rumour has it, the shadows smell like peanut butter! Yummy plus that jelly shade looks gorgeous! Also,as you might know, I am not a huge makeup fanatic, so it I am quite surprised by how badly I want, correction, NEED this pallet in my life! Denim is looking like one of the big trends this spring, but I am picky in the manner that I wear denim. I am not a big fan of denim skirts or dresses as well as traditional denim overalls. However, Wilfred Free has done a fabulous job in designing this denim romper. The denim looks light weight and I like how the the cinched waist will make the top half flowy. I also think a denim camisole would be a unique way of rocking this trend. Tuck it into a white maxi high waisted flowy skirt would be an effortless chic look. Smart watches have been popping up everywhere. Even Fossil has released the Q line. However, I want to get the Fitbit Alta as it tracks sleep patterns through the night. Plus, Fitbit has the forerunner fitness trackers so I trust that they have worked out all of the bugs! Also, needing a new purse. Loving Coach's Saddle Bag 23 which is a nod to their 1941 collection. The tassels are hand tied and made with premium quality level. The craftsmanship on the premium level Coach bags is always stellar. I try to always go for a style where the bag itself is the centre of attention and not the brand. As in, I always avoid bags that are plastered with the brand's logo. I also need to get on the Ghillie trend and pick up a pair of the flats soon! Definitely going to channeling my inner ballerina with these! Lastly, a pair of climber earnings. I generally stick to studs because I find I look funny earnings that hang. The climbers are cool because they are different and the simple rod is chic!